Enlightenment – Life the Way it is is based upon questions and answers by Sadhguru Jaggi Vasudev. Sadhguru is an Indian mystic with thousands of followers all over the world. I visited his impressive ashram, Isha Yoga Center, in Coimbatore some years ago and I left with some disappointment, mainly because of the staging of Sadhguru led by a huge group of super annoying devotees who controlled the place in every detail and. I never got to talk to Sadhguru himself, but after my stay, I read a couple of his books. Jaggi Vasudev has published a number of books, but none of them are in the Public Domain, but yesterday I was suggested to post this, and here it is (83 pages/1,8 MB). Enlightenment – Life the Way it is is based upon questions and answers by the Indian guru Sadhguru Jaggi Vasudev. Do u have Tamil version?? I am sorry, no. Let me know if you find it somewhere. Thank you. I shall keep checking this place for further books by Sadhguru. May energies help you to solve the secret of your life. Am I the only person who is suspicious that Jaggi Vasudev is repititor of Osho’s words? The whole world is suspicious, never mind if he is a repitetor of osho, Jesus or anyone unless his teachings are only for good and upliftment. When we talk about osho,we only experience witness of life. But sadhguru don’t limit himself to that dimension.he is all above ones perception. Just be with him rather than comparing. Any one honest to God can wear it. His talks and his supporters both I find to be justifiably suspicious. Like post 7 for example, trying to use the ‘spiritual’ tactic of – put your doubts away, it’s all ego, listen to the message. Jaggi is on a pretty large ego trip as are many of these who parrot him. And he’s also concerned with spreading Hinduism and Indian culture while telling everyone, it belongs to everyone, therefore it’s not Hindu. Yes, Hindu imagery everywhere, huge statues of cows, promoting India’s greatness (which is quite ok, but it should remain separate from spirituality) – and he enjoys major media coverage while getting attention for himself and his pet causes. I’ll stop there. Thank you for sharing all of these wonderful downloads! 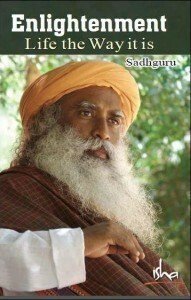 So good to find a book by Sadhguru. Thanks.